After their defeat in China's civil war, remnants of Chiang Kai-shek's armies took refuge in Burma before being driven into Thailand and Laos. Based on recently declassified government documents, The Secret Army: Chiang Kai-shek and the Drug Warlords of the Golden Triangle reveals the shocking true story of what happened after the Chinese Nationalists lost the revolution. Supported by Taiwan, the CIA, and the Thai government, this former army reinvented itself as an anti-communist mercenary force, fighting into the 1980s, before eventually becoming the drug lords who made the Golden Triangle a household name. Offering a previously unseen look inside the post-war workings of the Kuomintang army, historians Richard Gibson and Wen-hua Chen explore how this fallen military group dominated the drug trade in Southeast Asia for more than three decades. 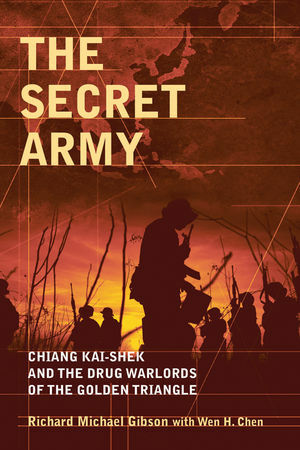 A fascinating look at an untold piece of Chinese—and drug-running—history, The Secret Army offers a revealing look into the history of one of the most infamous drug cartels in Asia. Richard M. Gibson earned a BS in 1965 and in 1966 an MA in history at San Jose State College, San Jose, California. As a Naval officer from 1966-71, he served aboard ships in the Gulf of Tonkin and taught history at the US Naval Academy, Annapolis, MD. In 1971, Gibson joined the US Department of State as a Foreign Service Officer. His postings included Martinique, French West Indies, Burma and Japan. He speaks French, Thai, and Japanese fluently, and received the Department of States meritorious and superior honor awards. Wen-hua Chen earned a BA in Chinese literature from Tunghai University, Taiwan and an MA in oriental history at Hiroshima University, Japan. Chen also studied at Taiwan’s prestigious Academia Sinica. In 1975, he began a career with the United Nations as a Chinese translator, working in both Bangkok, Thailand, and at UN Headquarters in New York. He retired in 2000 and has been pursuing various writing projects, publishing several works in Chinese language periodicals in Taiwan, Hong Kong, and the United Kingdom.